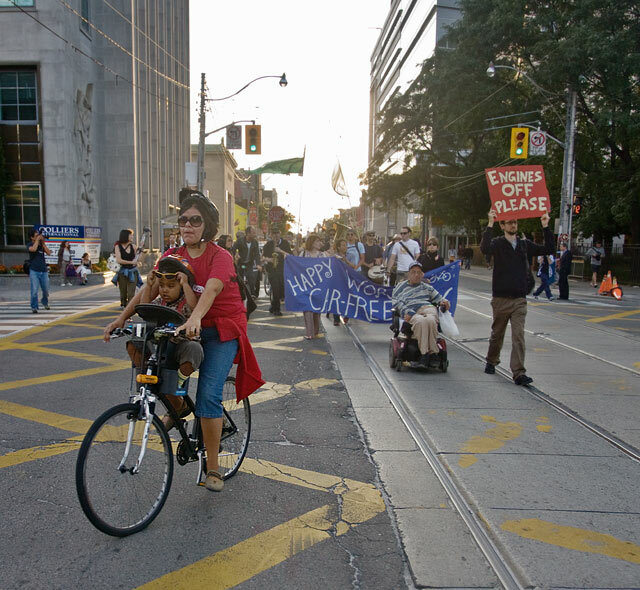 World Car Free Day at Queen and University in 2008. Photo by Miles Storey/Torontoist. It’s (almost) all bikes, all the time, in today’s Urban Planner: Car Free Day in Queen’s Park, a freebie concert at Yonge-Dundas Square, BIXI dreamin’, The Future of GTA Transit, and some art. CELEBRATE: Good news, cyclists: today is Toronto’s Tenth Annual Car Free Day! Bike on down to Queen’s Park (not Yonge and Dundas—they’ve moved this year) to see and play on Queen’s Park Crescent the old-fashioned way: car-free, from 10 a.m. to 2 p.m. Besides dancing in the street, activities include an art battle and charity auction, free yoga, giant board games, mini golf and badminton, and (the slightly less fun) cyclist safety awareness. When you’re done staying safe, walk over to the bicycle service station at the AGO, from 4 p.m. to 7 p.m., for a free map, Toronto Cyclist Handbook, and bike check-up. Queen’s Park, 10 a.m.–2 p.m., FREE. MUSIC:Before the weather goes all Canadian on us, check out Serenades in the Square, a free lunchtime show of jazz, roots, and folk in Yonge-Dundas Square. Today, Montreal performer Amanda Mabro showcases her latest project, the Wine Flow and Red Rows sister EPs, which Mabro’s been touring across North America and Europe. The pop songstress also has a background in dance, so you can expect a good show. Yonge-Dundas Square, 12:30–1:30 p.m., FREE. WORKSHOP: If you’re not all biked out from before, peddle over to the Centre for Social Innovation. They will be chatting about BIXI—the wildly popular bike-sharing system that’s been long promised to Toronto. They need a thousand people on the dotted line—and have already scored six hundred—so tonight’s talk is to explore strategies to get the message out and encourage BIXI members. With any luck, we’ll be cruising by next spring. Centre for Social Innovation (215 Spadina Avenue, 4th floor), 7 p.m., FREE. TALK: Since it seems we have a theme happening here, why not expand your thoughts to include transit in general? Post Carbon Toronto, in collaboration with the University of Toronto, presents a talk by Steve Munro: The Future of GTA Transit. The Q&A panel includes Dr. Danny Harvey and David White discussing the shape of future local transit—and here’s hoping the Queen car arrives on time for once. Health Sciences Building (155 College Street), 7 p.m., FREE (suggested donation $2). ART: Sick of all the transit talk? Dive into the AGO’s newest exhibition: At Work. The installation tells a tale about the labour of art and the process of the artist in the studio. Featuring the work of three international artists—Eva Hesse, Agnes Martin, and Betty Goodwin—the installation showcases their major works alongside their writings, studio, and archival material. The show runs through until the new year, and hey, maybe you’ll find some inspiration already. Art Gallery of Ontario (317 Dundas Street West), FREE with admission.